Last month, the Jack C. Montgomery VA Medical Center became the first VA facility to perform a new revolutionary vascular procedure for patients requiring hemodialysis, a treatment for kidney failure. 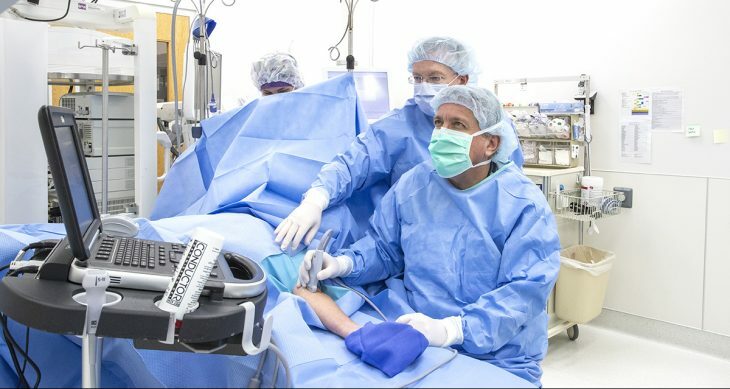 Surrounded by a team of fellow vascular surgeons, Dr. Mark Randel, Chief of Surgery, used a new method to perform the procedure which makes the vein more easily accessible for the insertion of the needles required for hemodialysis treatment. Since 1966, the method to accomplish this type of access involved using an incision to create an opening between an artery and a vein and then connecting them together. This surgical procedure typically results in discomfort for the patient and a lengthy recovery time. Generally, a patient may have to wait up to three months before the vein can be used for access due to wound healing requirements. Unlike the surgical method, the new procedure uses an endovascular approach (endoAVF) using a device that goes through the skin, under ultrasound, to create access. This method leaves the skin without a scar and the tissue undisturbed. In addition, the access for hemodialysis treatment can potentially be used earlier than with the traditional approach. (Left to right) Gene Reu, Vice President R&D/ Operations for Avenu Medical; Mark Randel, Chief of Surgery at Jack C. Montgomery VA Medical Center; William Jennings, Vascular Surgeon at the University of Oklahoma; Peter Nelson, VA Physician and Chief of the Vascular Surgery Division at the University of Oklahoma; Alexandros Mallios, M.D. of L’Institut Mutualiste Montsouris in Paris, France; Brian Driscoll, Director of Marketing and Clinical Education for Avenue Medical. Bringing this new procedure to the Jack C. Montgomery VA Medical Center was a collaborative effort between the Eastern Oklahoma VA Health Care System and the University of Oklahoma Surgical Division. Dr. Randel was joined by one of the pioneers of endoAVF, Alexandros Mallios, M.D. of L’Institut Mutualiste Montsouris in Paris, France, and Dr. Peter Nelson, VA Physician and Chief of the Vascular Surgery Division at the University of Oklahoma (OU) for this historical moment. 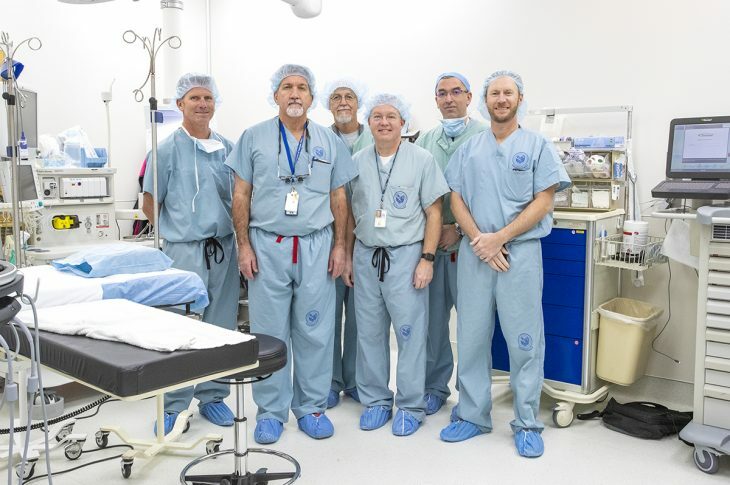 They performed three procedures successfully on December 7, 2018. Also present was Dr. William Jennings, Vascular Surgeon from University of Oklahoma; Gene Reu, Vice President of Avenu Medical, and Brian Driscoll, Director of Marketing and Clinical Education for Avenu Medical. Avenu Medical is the developer of the Ellipsys device used in the procedure.